"It's a fine hat, but I wouldn't like to wear it in the rain"
When Mr Monkey visited the Victoria and Albert Museum to see the HATS : an anthology exhibition he found out that Stephen Jones, the milliner who had arranged the exhibition, had designed a beautiful paper hat specially for the exhibition and for the Guardian newspaper. Obviously, Mr Monkey suggested very strongly that Mr Rik make him a monkey-sized version of the hat. 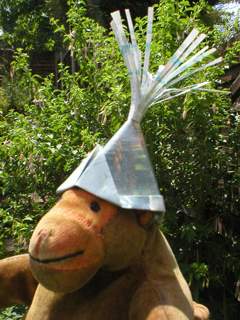 When it was done Mr Monkey went outside into the sun and found out that the hat worked just as well worn sideways as it did worn in the right direction. You can download the instructions for the hat at the V & A website. 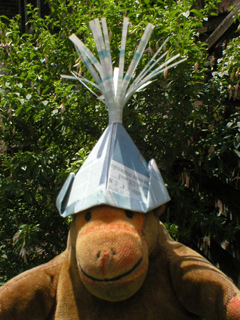 Mr Monkey's Stephen Jones hat was made from paper printed on both sides with a much reduced scan of two pages from The Guardian.